After a long period of deliberation and excuse-making I finally sat down and started planning the first ever printed booklet of Always Strange creature art. Over the years I have amassed quite a collection of individual character illustrations, some of which have been turned into one-of-a-kind original pieces (woodburnings, watercolors, prints, etc). Although these originals were fun to create and show at exhibitions, I felt sad to part with the art making process after they were framed or sealed. As an artist, you spend a long amount of time creating something and this process becomes very intimate. Once you're done, it's almost like saying goodbye to a dear friend who leaves after a visit. This is why I thought a coloring book would help solve my problem. With a coloring book I'd get to create something and finalize it for sale but someone who purchases it can pick up right where I left off. This way the process continues and someone else gets to enjoy it with me. 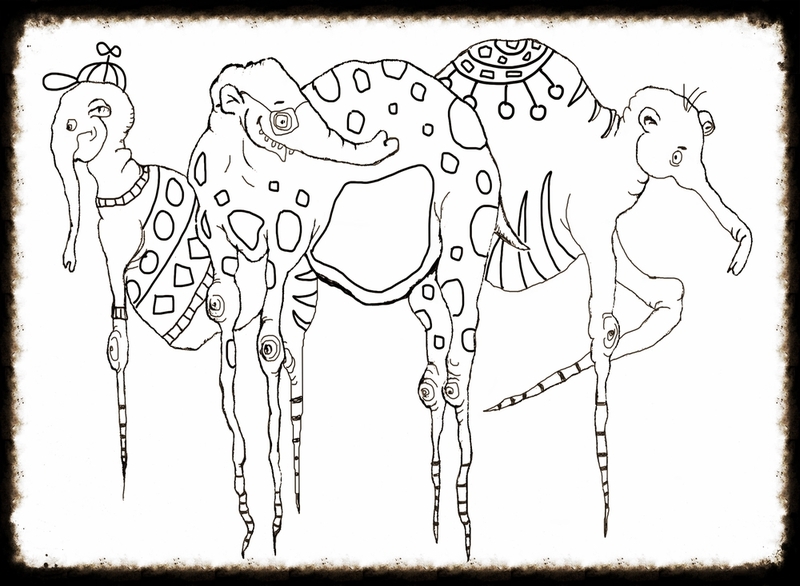 A single page from the book - original elephants on Dali-esque legs with extra detail added in just for the coloring book. The book assembly process was a new learning experience for me. After having finally figured some things out the majority of the work was technical and administrative. Between multiple bouts of editing for quality and size, and running back and forth to the print shop, this book went through a total of six versions. Dear friends and fellow artists provided vital feedback on the content and its appearance. It's sometimes hard to hear criticism, especially about your first "baby", but it is this feedback that drives the product closer to something that people would want to buy and color. Now a little bit about Strangeland and its inhabitants. Every single time I pick up my favorite micron pen and draw a whimsical creature almost all of them end up sharing the same lumps and protrusions - something that has marked my style over the years. Just like people who live in the same country or neighborhood who share a language and a culture my creatures have enough in common with each other to necessitate a unique space. That's where the Strangeland idea came from - it's a land where all creatures designed by Always Strange live and play! This first coloring book introduces Strangeland and showcases some of its dwellers. They pose for you like in old portraits, often holding their favorite items to give you a better idea of who they might be. Throughout the book's pages you will also find clues about the scenery of Strangeland, its architecture and landmarks. In the next Always Strange book, this land of creatures will open up and present itself to you in greater detail.